confusing and challenging, I had a feeling that we as nurses often apply these schools of thoughts in a variety of our practice settings without being aware of them. To give tribute to the work of nurses that is often based on the philosophical schools of thought of realism and relativism, under the mentorship of my professors, I decided to write this article entitled “Realism and relativism in the development of nursing as a discipline”. This paper presents the role of realism and relativism in the development of the discipline of nursing, as well as underscores the contribution of these two schools of thought to the work of nurse clinicians, nurse researchers, nurse educators and nurse theorists. 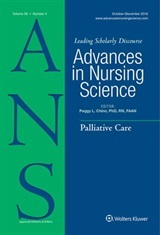 As the target audience of the journal “Advances in Nursing Science” include nurses from different specialty areas who have varying levels of understanding about philosophy, while touching upon the basics, this paper intends to discuss the role of realism and relativism in nursing education, nursing research, evidence-based nursing practice, and nursing theory. Specific examples of nursing activities have been discussed in the paper to facilitate the readers to understand how realism and relativism shape the amazing work of nurses and contribute to the development of nursing as a discipline.